Our Northeast PA regional headquarters is located at 101 W. 3rd St., Williamsport, Pa. Locally, our customers bank with us at nearly 50 offices across 23 counties, including: Carbon, Centre, Clearfield, Clinton, Columbia, Huntingdon, Juniata, Lackawanna, Luzerne, Lycoming, Mifflin, Monroe, Montour, Northumberland, Pike, Schuylkill, Snyder, Sullivan, Susquehanna, Tioga, Union, Wayne and Wyoming County, Pa.
Phil Johnson serves as Group Vice President and President of M&T Bank’s Northern Pennsylvania region. He has more than 35 years of experience in the financial services industry, including more than 25 years with M&T Bank. 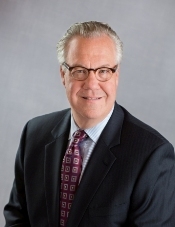 Johnson currently serves at the executive or chairman level for a number of local organizations, including: Williamsport/Lycoming Chamber of Commerce, Greater Wilkes-Barre Chamber of Commerce, UPMC Susquehanna, Misericordia University, Penn College Foundation and the Wilkes-Barre Family YMCA.